Fred Bryant with his dogs (L-R) Chime, Bell and Slash. When pedestrians and cars gave way to sheep in the normally quiet King Country town of Te Kuiti on March 30, head shepherd Fred Bryant was ensuring all the action unfolded without a hiccup. The 27th Great New Zealand Sheep Muster saw hundreds of sheep herded down the town’s main street under the watchful eye of Fred, a local sheep and beef farmer. He’s been involved with the muster almost since it began, and this year took over head shepherd duties from long-serving volunteer Peter Bird. Fred manages a 650ha sheep and beef farm at nearby Puketutu, and has lived and worked in Te Kuiti and surrounding areas for almost 20 years. 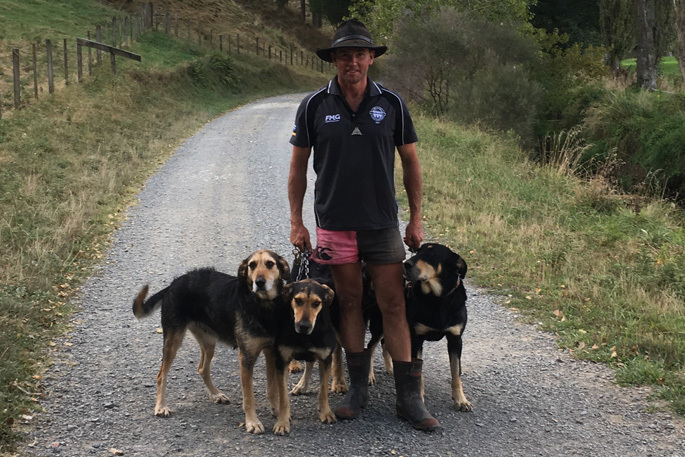 Fred, his dogs ‘Chime’, ‘Bell’ and ‘Slash’ and a few other local sheep farmers and their dogs had the job of keeping the notoriously unruly sheep on course, which ends at Te Kuiti’s stockyards. While it is “bloody busy on the day”, the muster is just another day at the office so to speak for the experienced shepherd, who has been a sheep and beef farmer for the last 18 years. The sheep arrived by truck from one of Reon and Wendy Verry’s properties situated 15km south of Te Kuiti before being offloaded. Then they were released in groups and followed down the road by a shepherd and their dogs. Animal welfare is important, and all mustering is done on foot with the assistance of 10-12 dogs. Barriers separate the sheep from the crowd, but in the event’s early days it wasn’t all smooth sailing, says Fred, although things have been largely trouble-free in recent times. “We’ve had some fun and games over the years,” says Fred, who recalls times where sheep have broken through barriers and run over the railway lines or broken through local shop windows. The team has the process refined down pretty well now – but the hardest part is getting the hundreds of sheep started down the road, which has barriers on each side. “Once the lead sheep heads off, it’s usually all go and the others quickly follow,” says Fred.